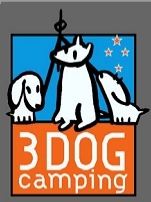 After lots of research and grilling a number of manufacturers, 3 Dog Camping (Australia) came up trumps. They offered even more than we had expected possible and were just a dream to deal with. As much as a cliche as it sounds, we were so impressed with the product that we bought the NZ distributership and started 3 Dog Camping Ltd. So how do we work? Well, we are Kiwi's through and through and do as much as we can in New Zealand. That means that the trailers are manufactured in NZ (no cheap imported Chinese trailers here), and all the parts to put the camper trailer together are either made or sourced in NZ. We also think it is pretty neat that one of the owners, and the designer, of 3 Dog Camping in Australia is a born and bred kiwi. So we can justifyibly say that these puppies are built for New Zealand conditions. After deciding on the tent we looked at the trailer. Kea Trailers was an easy choice. 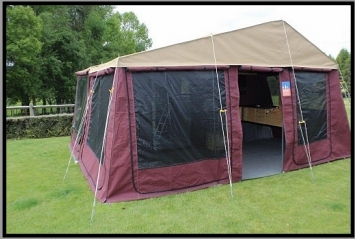 They've been around a long time, make an excellent quality commercial trailer which they can customise to what we want. And for the finishing touches, the trailer had to be able to be used as a stand alone trailer (which it is). The poles, guy ropes and pegs all had to be heavy duty and galvanised (and they are). The mattress is 150mm thick (many only have 120mm thick which you can tend to bottom out in). The kitchens had to be sturdy, simple, flexible and in the spirit of camping which is why we haven't gone the stainless steel way. Its no wonder that it is starting to hot up here at 3 Dog as people get ready for their summer camping. Get your orders in now and beat the rush! 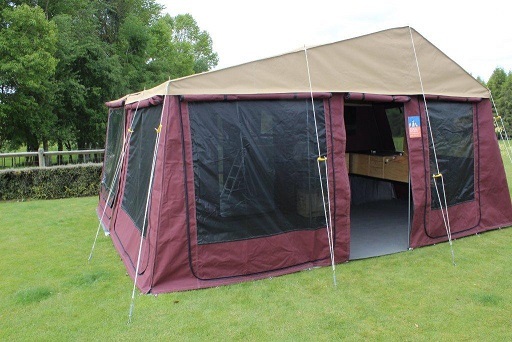 Camper Trailers are not really a new invention - you may remember back to the days of the Pop Top and similar systems. Well things have certainly improved since those days! 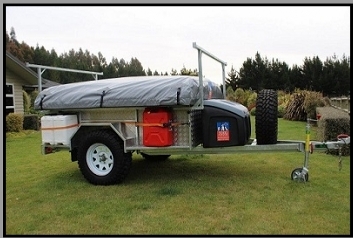 It is no wonder that Australia is camper trailer crazy when you see how quick, easy and sturdy they are. It is also not suprising that this craze is hitting New Zealand by storm! As the owners of 3 Dog Camping NZ Ltd, we are a (young???) couple with three young children. We knew exactly what we wanted in a camper trailer, having first seen them in Australia. What a range over there with about 400 manufacturers to choose from! And it had to look stylish!